Lex Luthor is dying thanks to a plague supposedly unleashed by the Cadmus Project. Lex declares that if he is going down he is taking Cadmus and Superman with him. To this end he unleashes a recreated whale creature known as Cruiser that is ten times faster and more powerful than the original. At the Daily Planet Perry White holds a staff meeting to get ideas on how to increase circulation. Clark hears Jimmy's signal watch and moments later Superman streaks across the skies of Metropolis. Cruiser has undermined a tenement building and Superman saves the people that live there though the building itself falls. Later Lois visits Emil Hamilton and learns more about the disease ravaging the clones and creations of Cadmus. Cruiser strikes again as Lois rides the subway home and Superman saves her. Cruiser sets his sights on Cadmus next as Superman is discussing recent events with the Guardian. The fight is brutal as Superman discovers that this Cruiser secretes a toxic slime that can hurt even him. When Cruiser erupts from the ground near the LexCorp building Superman forces the creature down into the molten core of the planet. The day is saved and a now bald Superman meets up with Lois who suggests he might want to wear his old fedora until his hair grows back. Story - 4: This is going to be a really weird review to write. For those of you who are not "in the know" I co-host (along with Jeffrey Taylor) a little show called FROM CRISIS TO CRISIS: A SUPERMAN PODCAST right here at the Superman Homepage. Jeffrey and I have a simple mandate for that podcast; cover every Superman comic published between MAN OF STEEL #1 in 1986 and ADVENTURES OF SUPERMAN #649 in 2006. The main reason I wanted to produce the show is that I love the Post Crisis era of Superman. Just about every fan of the comic book adventures of the Man of Steel has a favorite era and more often than not that era takes place when they were in their formative comic book years. This is very true in my case. I started reading the Superman books full time in the spring of 1987 at the age of eleven, so my "golden-age" as a collector was a year or so after the Post Crisis era began. Because of this the next decade of Superman books mean a great deal to me. They were the constants in my life as I was growing up. I read and re-read those issues quite a bit, especially when I was a teenager because I didn't buy that many comics at the time (boy that would change) and I wanted to get most out of my comic book dollar. More than anything I was completely sucked into the drama of the Superman books. In the days before reading solicitations on the Internet for the comics coming out in two months my only guide as to where the story was going were the next issues boxes and sometimes those things could be torturous. You could say it was a simpler time but I don't think it was. I was just less cynical and more apt to get completely lost in the world that Jerry Ordway, Roger Stern, Dan Jurgens and eventually Louise Simonson would create. I was very excited when DC announced this line of RETROACTIVE books and was even more excited when I found out the Louise Simonson (along with Jon Bogdanove) were tapped to write (and draw) the '90s era Superman story. I thought this was a fantastic choice as I have a great deal of fondness for what Simonson brought to Superman and his supporting characters. Then I got REALLY excited when it was revealed that the story would take place "between the panels" of the comics published in the spring of 1994. I remember those stories and the time period they came out during vividly. I was a senior in high school that spring and the Superman books were firing on all cylinders after the end of "Reign of the Supermen". That spring the "Battle for/Fall of Metropolis" storyline began and it was a game changing storyline for several reasons. First, Lex Luthor the Second was slowly dying. Two years before it was revealed that Lex the second was actually a cloned Lex the first with a transplanted brain and now that new and younger body was breaking down. As a long time reader this was a huge deal and it felt like I was being rewarded for following the books for so long. Second, Lex's anger caused chaos to erupt all over Metropolis and finally, in ACTION COMICS #700 he destroyed a large section of the city. It was epic and the damage Lex caused was not wrapped up neatly in the next issue. It was several months before things settled down or settled down as much as they do for Superman. There was action, intrigue, a little romance and a climactic battle between arch-enemies. I loved every minute of it. Missing an issue was not an option and getting a previously "untold" chapter that took place during those stories is fantastic. It was hard to be objective while reading "Speed" because I had to balance writing a review while at the same time getting hit with waves of nostalgia. Reading this story and seeing these characters as they existed nearly twenty years ago was an emotional experience. That may sound silly but it's not given how much those original stories mean to me. Luckily Simonson gave us an excellent story that while tied to comics published in 1994 can stand on its own in 2011. This is due to the fact that the plot is fairly straightforward; Lex Luthor has a mad-on for Superman and uses a strange creature to try and kill him. It's a classic Superman plot that works in any era. The choice of the strange creature Simonson used surprised me for two reasons the first being that Cruiser is just an odd choice to begin with and the second being that Jeffrey and I just covered the original appearance of Cruiser not too long ago on From Crisis to Crisis. I opened the page, saw Cruiser and thought, "HEY! We just talked about him. Awesome." The new Cruiser was used to good effect as was Lex even if he was a tad on the two dimensional side at times. One of my very few complaints about this story is that Lex's motivations stem from Superman getting good press and having a full head of hair rather than for him slowly dying of a clone specific disease. It was light hearted and I did enjoy myself but at the same time Lex' behavior did take me out of the story right there at the beginning and then again at the end. I also didn't care for the bald Superman either but that was more me being a continuity hound than anything else. Again, it was cute and funny and I loved that scene at the end between Superman and Lois but I kept trying to wrap my head around the fact that at some point during "Battle for Metropolis" Superman went completely bald and within days had a full head of hair again. It shouldn't matter but for me it did but not in any deep or meaningful way. Other than that I enjoyed this story. It had everything about this era of Superman that I loved and remembered. Perry White was the Perry I remembered. Jimmy had a great scene. The relationship between Lois and Clark was spot on. We got to see Guardian and the Newsboy Legion, Emil Hamilton, the Underworlders, Myra and the kids from the Coates Children Center. Simonson hinted that Steel would make an appearance and he did albeit in snowman form. This story did exactly what it was supposed to not only as a time capsule for the nineties but also in showing a new audience what it was like to read the Superman titles around 1994. More than that it was a fun read and frankly that was the most important thing, at least to me. Art - 4: I have to admit that I wasn't the biggest Jon Bogdanove fan back when he first started drawing SUPERMAN: THE MAN OF STEEL in 1991. In fact I actively disliked his art for a number of years until one day it just clicked for me. It is one of those ineffable things about my personal tastes; one day I hate something the next I can't get enough of it. As I mentioned above this story is set during the build up to the "Battle of/Fall of Metropolis" epic. Bogdanove's art, however, looks more like the work he would do towards the end of his run on SUPERMAN: THE MAN OF STEEL. This is by no means a negative criticism, just something I noticed. Overall I loved his art in this story. It looks current and yet it has a real familiar feeling to it as well. It was almost like seeing old friends for the first time in over a decade. The supporting cast (Lois, Perry, Jimmy, etc.) were just as I remembered them but with the new coloring they looked contemporary. It was weird but I liked it quite a bit. Emil Hamilton looked a bit strange but that's a very minor complaint. The new Cruiser made me smile and played to Bogdanove's strengths as far as drawing weird and otherworldly looking characters. Lex looked messed up throughout the story but that was rather the point as his body was breaking down.. It was neat seeing Clark with his long hair again and make no mistake, folks, Clark had long hair. I have long been a champion of the fact that Clark/Superman did NOT have a mullet during this time period despite how certain covers or panels made it look. Scotty V discussed this in one of his GREAT SCOTT segments a month or so back and made a great case for the fact that Clark was not sporting a mullet between "Reign of the Supermen" and the wedding and for that I publicly thank him. If you look at Clark throughout this story his hair is slicked back and you just can't do that with a mullet. So yeah. Not a mullet. Clark looked great, by the way. My only real quibble with the art for this story is that every once in a while Superman looked a bit...off. This is something that would happen during Bogdanove's initial run on SUPERMAN: THE MAN OF STEEL. In certain panels Superman looked fantastic, like on the splash page or when he was saving those people from the collapsing tenement. In others, like the scene where he is standing with Guardian and the Newsboy Legion, he doesn't look as good, at least to me. The great shots of Superman far outweighed the bad, though, so I really can't complain all that much. Superman takes on three warriors from the recently departed Warworld that are stealing scientific equipment. They are able to escape by endangering a group of scientists who Superman is forced to save. Later the Warworlders break into Emil Hamilton's lab and not only attack him but make off with some of his gear. Hamilton chases them into the sewers and meets up with Grub, someone Ham knew during his brief time in prison. Grub is joined by several escapees from the Cadmus Project who are living in the sewers because they can't find acceptance on the surface world. They track the Warworlders to another section of the sewers and discover that they were stealing the equipment to build a giant bomb. One of the Warworlders initiates the countdown but the vibrations attract the attention of another Cadmus reject known as Cruiser. Cruiser, a giant whale looking creature, swallows the bomb and heads to the surface. This attracts Superman's attention and suddenly the Man of Steel is trying to stop Cruiser while the Warworlders attack him. Finally Superman defeats the Warworlders and flies Cruiser into space where he "harmlessly" explodes. Back on the ground Superman discusses the Cadmus escapees with Hamilton and Grub while the Warworlders plot to infiltrate the sewer society and take over. Story - 4: It is strange reviewing a story for the second time in a month or so. It is even stranger writing that review instead of just jotting down some talking points and...talking but I'll give it a go anyway. I honestly can't imagine what it must have been like for readers unfamiliar with the Superman of 1992 to read this story. There are so many little sub-plots running through these twenty-two pages that it would be easy to get confused. For me it was great because I was reading the books at this point and would have known what was going on even if I wasn't co-hosting a podcast about this era. The firing of Sam Foswell, the weird exchange between Emil Hamilton and his girlfriend (in case you were curious she is holding her neck because she had been bitten by a vampire recently, no foolin'), the scene with Metallo and even the references to "Panic in the Sky" are odd out of context but if you were reading the four Superman titles at the time (which would have cost you a whopping five dollars a month by the way) it was all part of the rich tapestry that the creative teams were weaving. Wow, that was really flowery. I don't know how I feel about typing that. Ah well...it happened. Time to move on. The main story was a lot of fun. I really liked these Warworld refugees, especially the little guy, and it was neat to see them not only go up against Superman but also against Emil Hamilton and the runaway Cadmus creations. Emil Hamilton was such a great character and he really got to shine here. You also got to see Superman fighting a giant whale creature that was tearing up huge sections of Metropolis. There is absolutely nothing wrong with that. I have two problems with this story; one minor and one pretty big. The minor problem is that Superman threw Cruiser into outer space to die. I realize he had no choice but there was something really odd about that. The bigger problem is the fact that Hamilton set up events so that Cruiser would eat the giant bomb, which seems like a sound plan at first. Then Cruiser explodes in the cold vacuum of space and I realized, "Holy crud, that explosion would have leveled Metropolis." That is messed up and shows that while Hamilton may be extremely intelligent and be able to come up with awesome force field belts he can still make some mistakes when it comes to calculating how dense a seemingly unstoppable whale creature is in terms of containing an explosion. Art - 3: The deeper Jeffrey Taylor and I get into From Crisis to Crisis the more I realize that the issues of SUPERMAN: THE MAN OF STEEL I like the least on an artistic level are the ones where Bogdanove only does the layouts. They just don't look as good to me as the issues where he does the full pencils. It's like whoever finishes him (Dennis Janke or in this case Hilary Barta) misses something essential to Bogdanove's style and the art becomes uneven. On some pages everything is great such as the splash page of Superman flying towards "the camera" but then on the very next page he looks awful. The storytelling is very strong, though, and as I mentioned earlier Bogdanove is fantastic when it comes to drawing weird looking characters. This may not be the strongest issue of SUPERMAN: THE MAN OF STEEL when it comes to the art but it is not the weakest either. Cover Art - 5: The great thing about this cover is that it is misleading. Usually I don't like such things but in this case it worked because it made me think this story was going to go in one direction and it went into another. 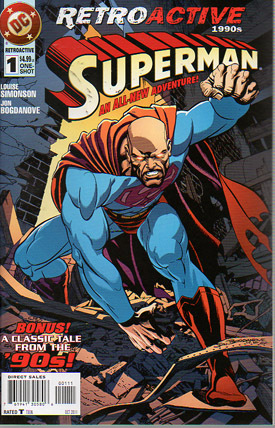 Based on the early reports of this special I thought that the bald headed Superman on the cover was going to be Lex Luthor or yet another clone of Luthor or maybe even a new Bizarro but no...it's the real Man of Steel and I like that a whole lot. Plus the cover is just dynamic. Superman is large and in charge and looks great. Definitely some of Bog's best work on the character even if he is bald. At least he doesn't have a mullet.